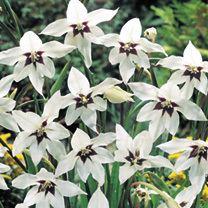 Plant 7.5cm (3") deep and 15-23cm (6-9") apart in late April or during May, choosing a warm, sheltered and sunny position. Do not plant out before the soil becomes reasonably warm. To obtain earlier flowers, start in pots under glass and plant out from late May onwards. After flowering as the leaves discolour, lift the corms, dry, and remove remains of the foliage and store in a fairly warm, dry place until replanting time.